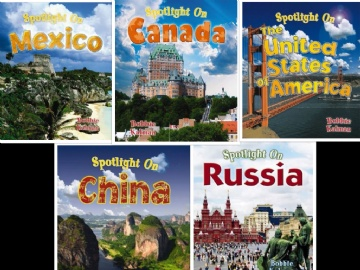 The mind-building lessons and activities in these books teach topics and skills drawn from state and national science standards to prepare students for more advanced science courses and new assessments that measure reasoning, reading comprehension, and writing in science. Students read lessons that include a variety of charts, tables, and graphs. Then they answer critical thinking questions to improve their understanding of the science concepts and develop their reading comprehension and inferential and deductive thinking skills. Students can't just scan the story for answers—they must carefully analyze and synthesize the information from the text, charts, tables, and graphs to explain and support their answers.Many questions in these books ask students to use complete sentences to explain their thinking. The ability to express their thoughts—supported by evidence—in writing, is not only important in science assessment, it is essential when communicating with other people in school and work. 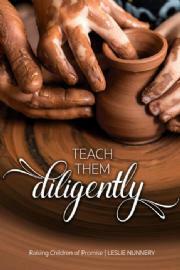 It also promotes better understanding of the concepts being studied. The questions in Science Detective® are modeled after questions found on science assessments but require more critical thinking. There is a growing trend to evaluate responses to open-ended questions in the context of logical reasoning, and many science students score poorly on these test items. 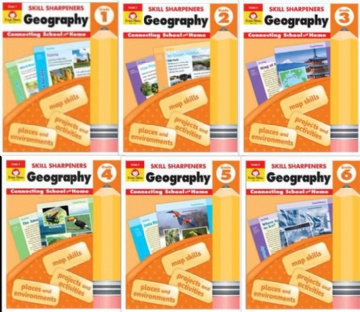 The carefully designed questions in in these books will not only develop thinking, reading, and writing skills, but will also familiarize your students with questions found on contemporary science assessments.Teaching SupportIncludes teacher and student introductions, a chart of topics and key ideas to help select activities, and detailed answers. In Seven Men, New York Times best-selling author Eric Metaxas presents seven exquisitely crafted short portraits of widely known — but not well understood — Christian men, each of whom uniquely showcases a commitment to live by certain virtues in the truth of the gospel.Written in a beautiful and engaging style, Seven Men addresses what it means (or should mean) to be a man today, at a time when media and popular culture present images of masculinity that are not the picture presented in Scripture and historic civil life. What does it take to be a true exemplar as a father, brother, husband, leader, coach, counselor, change agent, and wise man? What does it mean to stand for honesty, courage, and charity, especially at times when the culture and the world run counter to those values?Each of the seven biographies represents the life of a man who experienced the struggles and challenges to be strong in the face of forces and circumstances that would have destroyed the resolve of lesser men. Each of the seven men profiled — George Washington, William Wilberforce, Eric Liddell, Dietrich Bonhoeffer, Jackie Robinson, John Paul II, and Charles Colson — call the reader to a more elevated walk and lifestyle, one that embodies the gospel in the world around us. What makes a great woman great? 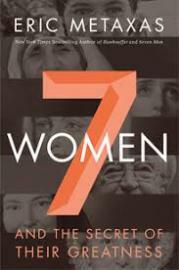 In Seven Women, New York Times bestselling author Eric Metaxas provides an answer by telling the captivating stories of seven women who changed the course of history and impacted the world in astonishing ways. Teenaged Joan of Arc heard God’s command and led the French army to a mighty victory over the British. Susanna Wesley, the mother of nineteen children, gave the world its most significant evangelist and its greatest hymn-writer, her sons John and Charles. Corrie ten Boom risked her life to hide Dutch Jews from the Nazis in World War II and somehow survived the horrors of a concentration camp, but her greatest feat was her forgiveness of her tormentors years later. And Rosa Parks’s God-given sense of justice and unshakable dignity helped launch the twentieth century’s greatest social movement. Seven Women reveals how the extraordinary women profiled here achieved their greatness, inspiring readers to lives propelled by a call beyond themselves. Meet Mr. and Mrs. Baker and their four children: responsible Phil, sensible Abby, daring Andy, and inquisitive Tom. The Bakers are a Christian family who love serving and helping others, but they have a knack for finding adventure while they’re at it! 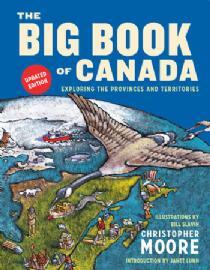 Exciting reading for youth in the six volumes of the Baker Family Adventures Series by C. R. Hedgcock. Recommended for ages 11-15, but make great family read-alouds too, for ages 6-10.People sometimes think that the Christian’s life is rose beds and sunny skies, but when the thorns start jabbing and the sun starts burning — that’s when the true test of character comes. The Bakers must deal with mysteries, kidnappers, buried treasures, and more, with each challenge forcing them to grow in courage and learn important lessons in godliness. ABOUT THE AUTHORWalter Farley‘s first book, The Black Stallion, was an instant hit when it appeared in 1941. Mr. Farley went on to write thirty-three other enormously popular books about the Black Stallion and other horses which were published in more than twenty countries. He died in 1989, shortly before the publication of his last novel, The Young Black Stallion, written with his son Steven. Did you know that many successful architects, lawyers, engineers—even bestselling novelists—had difficulties learning to read and write as children? In this groundbreaking book, Brock and Fernette Eide explain how 20% of people—individuals with dyslexia—share a unique learning style that can create advantages in a classroom, at a job, or at home. Using their combined expertise in neurology and education, the authors show how these individuals not only perceive the written word differently but may also excel at spatial reasoning, see insightful connections that others simply miss, understand the world in stories, and display amazing creativity.Blending personal stories with hard science, The Dyslexic Advantage provides invaluable advice on how parents, educators, and individuals with dyslexia can recognize and use the strengths of the dyslexic learning style in: -material reasoning (used by architects and engineers)-interconnected reasoning (scientists and designers)-narrative reasoning (novelists and lawyers)-dynamic reasoning (economists and entrepreneurs. 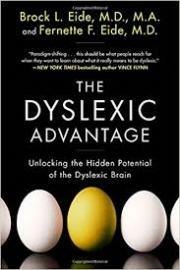 )With prescriptive advice and inspiring testimonials, this paradigm-shifting book proves that dyslexia doesn’t have to be a detriment, but can often become an asset for success.